Jerusalem is the emotional centerpiece of the long-running conflict, and Trump’s policy shift set off protests and condemnation across Arab and Muslim countries. Abdullah expressed concerns about the regional fallout from the Jerusalem decision. Jordan’s king appealed Sunday to Vice President Mike Pence to “rebuild trust and confidence” in the possibility of a two-state solution to the Israeli-Palestinian conflict, following fallout from the Trump administration’s decision to recognize Jerusalem as Israel’s capital. Pence tried to reassure the monarch that the U.S. was committed to restarting peace efforts and to a two-state solution, if both sides agree. Such a caveat deviates from long-standing U.S. support for that approach as the only possible outcome of any peace deal. Trump’s announcement on Jerusalem last month infuriated the Palestinians, who seek the Israeli-annexed eastern sector of the city as a future capital. They accused the U.S. of siding with Israel and said Washington can no longer serve as a mediator. Jerusalem is the emotional centerpiece of the long-running conflict, and Trump’s policy shift set off protests and condemnation across Arab and Muslim countries. It posed a dilemma for Abdullah, a staunch U.S. ally who derives his political legitimacy in large part from the Hashemite dynasty’s role as guardian of a key Muslim site in Jerusalem. Any perceived threat to Muslim claims in the city is seen as a challenge to Jordan, where a large segment of the population is of Palestinian origin. Pence told the king that the U.S. has committed “to continue to respect Jordan’s role as the custodian of holy sites, that we take no position on boundaries and final status.” It was a message Pence relayed Saturday during talks with Egypt’s president. “Look, friends occasionally have disagreements and we agreed to disagree on the decision by the United States to recognize Jerusalem as the capital of Israel. But what we agreed on was the need for all parties to come back to the table,” Pence said. “The Palestinian Authority has been absent from direct negotiations since 2014. 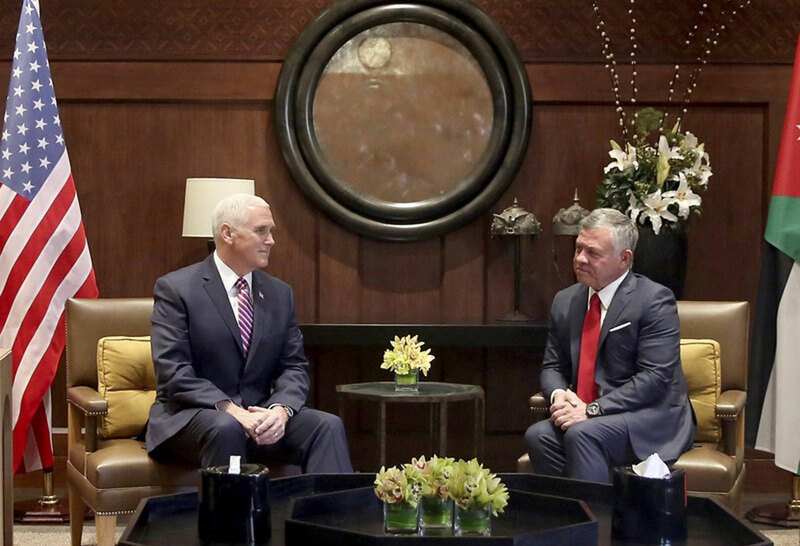 And I hope I impressed upon King Abdullah our earnest desire to restart the peace process,” Pence said. Abdullah expressed concerns about the regional fallout from the Jerusalem decision. “Today we have a major challenge to overcome, especially with some of the rising frustrations,” he said. He described the Pence visit as a mission “to rebuild trust and confidence” in getting to a two-state solution, in which a state of Palestine would be established in the West Bank, Gaza Strip and east Jerusalem, lands Israel captured in 1967. Another cause of concern for Jordan is the Trump administration’s decision to move the U.S. Embassy in Israel from Tel Aviv to Jerusalem. Jordan vehemently opposes such a move if taken ahead of an Israeli-Palestinian partition deal. Israel views Jerusalem as its unified capital. An international consensus has long held that the city’s final status should be decided through negotiations, which was also U.S. policy going back decades. Palestinians view Trump’s recognition of Jerusalem as Israel’s capital as a blatantly one-sided move. Palestinian President Mahmoud Abbas said he would not meet with Trump administration officials and called off a meeting with Pence that had been scheduled for mid-December. In a new expression of that snub, Abbas overlapped with Pence in Jordan from Saturday evening to midday Sunday, when the Palestinian leader flew to Brussels for a meeting with European Union foreign ministers Monday. There, Abbas is expected to urge EU member states to recognize a state of Palestine in the pre-1967 lines, and to step up involvement in mediation. Pence was scheduled to hold meetings on Monday with Israeli Prime Minister Benjamin Netanyahu, deliver an address to the Knesset and visit the Yad Vashem Holocaust memorial.